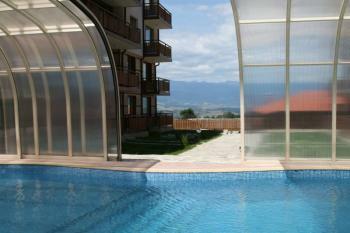 The swimming pool in apart hotel Four Leaf Clover in Bansko is covered. The water in the swimming pool is heated and is more than pleasant to sit in the swimming pool and watch while the weather snows outside. There is a direct connection from the swimming pool to the Spa center so just after or before the swimming pool you can have a massage or stay in the sauna or the steam bath for some time.